My Pillow is a renowned manufacturer of pillows, based in Minnesota. Since its founding in 2005, it has sold over 25 million pillows. This brand is acknowledged for its high-quality products, with good customer reviews, which are becoming more and more widespread. What's shocking is that MyPillow paid around $1000,000 as a result of a lawsuit for creating deceptive advertisement few years back (2016). After reading a huge deal of information relating to the case, we are of the opinion that MyPillow did not choose their words correctly and might, to a certain extent, exaggerated the effectiveness of their pillows. However, it's probably still one of the best pillows (at least according to the majority) available in the market at affordable prices. 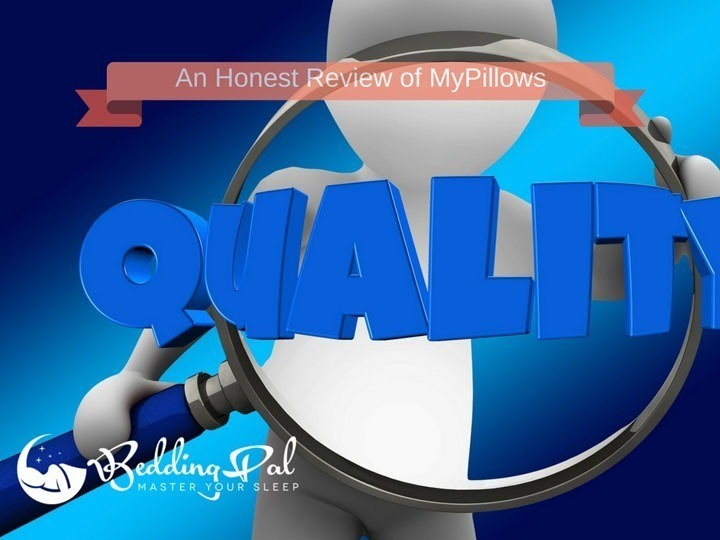 While the claims made by MyPillow might not be backed by extensive research and documentation (back then), they indeed received a ton of positive reviews from customers and many of them claimed that this pillow actually help them sleep better. In fact, we found that MyPillow uses excellent quality materials, originating from the US only (which is pretty rare these days considering the fact that most products are now manufactured in China). Below are some of MyPillow's product, feel free to check them out yourself and read the reviews there. Owned by Michael J. Lindell, MyPillow, Inc. is a company that manufactures open-cell, poly-foam pillows in Chaska, Minnesota. Its story is somewhat interesting, with the inventor’s journey to come across the right pillow to suit a particular person’s needs. Once he discovered that even the more expensive memory foam pillows would go flat over time, leaving him with a sore arm and a stiff neck in the morning, he decided that it was high time for him to create his pillows. Lindell’s dream was to find a pillow that would not lose its shape over time and would remain cool at night. He also wanted to be able to wash it in the washing machine and dry it in the dryer. Eventually, after experimenting with various fills and formulas, he designed what he called “the perfect pillow” in the summer of 2004. After that, MyPillow ads started appearing everywhere on TV. You probably even heard it, and never even realize that you’ve known it. The biggest giveaway is Lindell’s enthusiasm and passion for MyPillow. The pillow gained a lot of success with the ads and infomercials. With a 10-year warranty, this pillow was designed to be durable, as well as rid you of back and neck pain. MyPillow is a product that went through a lot of controversies; some people claimed it was heaven on earth, others were confused and angry. Why’s that, you may ask? It’s because of their “Buy one, get one free” deal. Consumers claim that it’s “false advertising,” and that they should be more honest. When Lindell refused the BBB’s (Better Business Bureau’s) suggestion to discontinue the offer, they brought the company’s rating from an A+ to an F. The problem wasn’t the offer; the problem was that they had it for too long already. Lindell was also sued for the claim that this pillow could help with fibromyalgia and sleep – which according to several testimonials, it wasn’t true. While not admitting to any faults, Lindell still paid the $1 million penalties but remained faithful to his belief. He believed that in both cases, the others were wrong and that all he wanted to do was to give people the best deal possible. He claims that the company is nothing more than a platform for a better cause – one that he would use to help other people worldwide. In our opinion, MyPillow should be more careful in selecting the right words to be used in their advertorials. This pillow has gone through a lot of controversies (will discuss more on it later in the articles). Nevertheless, it’s worth noting that one should take into account the manufacturer’s recommendations to enjoy its benefits to the fullest. So, MyPillow advises that as long as you take care of the pillow properly and clean it every few months, it will hang on to its properties. It is also advisable to use the dryer, since hand-washing and drying it naturally may reduce its puffiness. In the end, it all depends on your attention to detail. The pillow comes in different shapes and firmness levels, so you need to choose accordingly. It was created so that people would not have to wake up throughout the night and adjust the pillow continuously. The idea of MyPillow is to keep your spine in a line as straight as possible. Many pillows out there, even memory foam ones, will eventually lose their shape – making you use your hand for support. However, My Pillow was designed to keep its shape. Since your head will receive complete support, you will no longer be waking up in the middle of the night to adjust the pillow. This item was meant to offer relief from various sleeping issues so that you may have an uninterrupted sleep that lasts a whole night. My pillow was made with a patented 3-piece interlocked filling that will adjust to the personal needs of the sleeper – no matter if you are a back or a side sleeper. The pillow filling also contains a resin that allows the foam to keep its shape once the user adjusts it for their preferences. These items were also made to be dust mite resistant, non-allergenic, machine-washable and also dryable. It’s seemingly a great thing to have around if you want something easy to maintain. ***Yellow: Extra firm; White: Medium firm; Green: Firm; Blue: Normal. ***Important: Keep in mind that if you are accustomed to sleeping on down or feather pillows, then you may want to bring the hardness down one color notch. For instance, if the chart says that you need a “white,” you may be better off with a “yellow” one. Before making a purchase, it makes sense to have a look at honest products reviews, right? That is the primary purpose of the upcoming section in our article: to help you make a fully informed purchase. Since this pillow is part of the Classic Series pillows from MyPillow, it features a 2-inch gusset around the pillow for extra support and a touch of luxury. It will offer more adjustability for your sleeping needs. This classic pillow also has four different custom loft levels that you can buy according to your size and preferred sleep positions. It’s also washable and dryable, so there is no issue if you throw it into the washing machine and then the dryer when you feel like it needs a spin. The Classic Series pillow has an Open Cell Polyfill that will allow it to breathe and keep you cool throughout the entire night. It will remove the need of having to wake up throughout the night to switch to the cool side. Since the material is cotton, this classic pillow is non-allergenic. It’s resistant to dust mites as well, so it’s a good option if you have allergies. The pillow is machine washable. The filling can feel clumpy, especially after you wash it. It may feel overstuffed for some people. Part of the Premium series, this premium pillow has a 3-piece interlocking fill that will adjust to the shape of your head. The size is custom-fit, which is a nice feature. So, if you feel like the pillow you purchased is too firm for you, then you can just remove some of the fillings. That is entirely up to you since every user has his/her preferences. This pillow, like the others from the My Pillow line, also features three sizes of filling that will allow for adjustability and softness. Furthermore, since the material is shredded, the pillow will be able to breathe. As a result, it will stay cool, and you will not have to flip it over during the night. This premium pillow can be washed and dried in your own home. You will only need a washing machine and a dryer. Even the manufacturer recommends that you repair it once every few months. What does repairing your pillow imply? It refers to washing and drying the pillows on a regular basis. This way, you keep them fresh and clean and prevent them from becoming yellow. The pillow is fairlycool, so you will not feel hot during the summer. The foam is expandable so that it will contour around your head. It is machine-washable and allergen-free. Slightly more expensive than the standard version. If you are constantly on the road, then the Roll & Go travel pillow is something that may come in handy for you. Made with the same patented interlocking filling material, the pillow was constructed to form itself around your head and offer you proper support, keeping your spine straight. This pillow may be used by itself or placed on top of another pillow (for instance, one from the hotel), or you can use it as you are sleeping on the plane, automobile, or train. It’s relatively compact, and you can just roll it in a travel bag. This item will also work in providing you lumbar support if you have a desk job. You can also use it on a chair or couch while you are relaxing at home. Since it comes in ten colors – and patterns – you may choose the one that looks more attractive to you. Easy to pack and take along with you on your journeys. Suitable for back support if you are a short person. Too soft for some people. It is another pillow that was designed to be taken on road trips. With its compact dimensions, this pillow can be taken on any journey, no matter if you are going by car, airplane, truck, or if you’re simply planning to spend your night in a tent. As with the other pillows from this line, you may pick the firmness that you want, from yellow to blue. If you prefer softer pillows, then the medium “white” one may be an appropriate product for you. This product has a 10-year guarantee, and it is claimed that it will not go flat even after prolonged use. The reason is that it’s filled with a patented interlocking fill that will allow your skin to breathe while it provides full support for your back and neck. It puffs right back up when you take it out of the dryer. It’s very durable and feels cool during the night. May not be firm enough for some people. It has a slight odor during the first few weeks. Its time to conclude our reviews of my pillow. Indeed, this will be a very comfortable item for you. The common complaint is, however, that it will lose shape eventually – but it will also “puff back to life” when you put it in the dryer. That’s probably why the manufacturer recommends washing it every two or three months. Make sure you select the firmness level carefully. If in doubt, go for standard pillow as it perfectly suits to most of the people. Hope, the article helped. If you are looking for more, check our epic guide to buying the best pillows. Enjoy!